In case you haven’t been paying attention, Nazis are around. 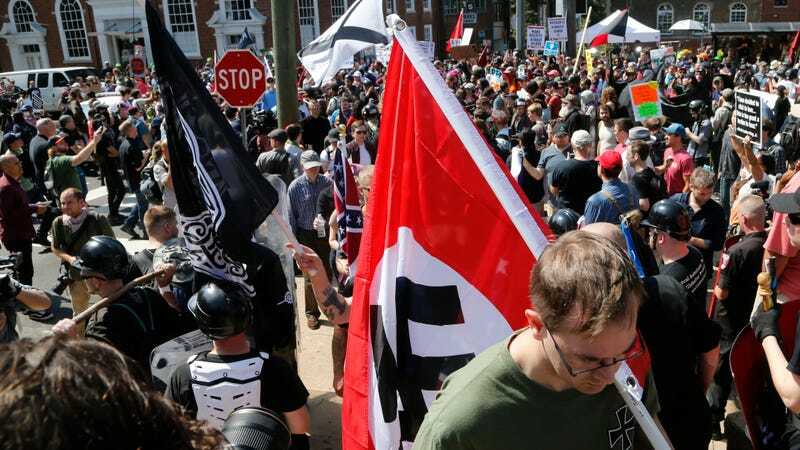 They’re carving swastikas into fields, leading protests with torches in hand while crying out for white nationalism, and forming new extremist hate groups that currently face allegations of murder. So it isn’t surprising to learn that the Anti-Defamation League found that incidents of anti-semitism rose 57 percent in 2017. In a report published on Tuesday, the A.D.L. documented 1,986 anti-Semitic incidents reported throughout the country compared to 1,267 reported last year. And for the first time since 2010 there has been a documented incident of anti-semitism, whether it be harassment, vandalism, or actual violence, in every state. The A.D.L. attributes the rise to a surge in incidents at schools and college campuses, which reportedly doubled for the second year in a row. Many of the harassment threats came from a string of bomb threats against Jewish community centers that happened at the beginning of 2017. In March 2017, CNN reported that there had been 100 bomb threats on Jewish centers since that January.